Because of the complexity of the San Jacinto River Waste Pits Superfund Site, the EPA has decided that additional information is needed prior to a recommendation of a cleanup alternative. The EPA plans to undertake an independent review of site modelling and potential river/weather conditions that might influence remedy selection. The National Remedy Review Board may be rescheduled at a future date. Once this is completed, the EPA will announce a proposed alternative in a Proposed Plan that will be available for public comment. The EPA will also host a public meeting during the comment period to allow public participation in the remedy selection process. The EPA anticipates that the Proposed Plan will be released for public comment during 2015. The EPA will continue to communicate with site stakeholders and the community on the progress at the Site. The high court will hear this case of if an insurer has to pay for law suits that are in fact administrative actions of government agencies in Texas law. At present, a number of such decisions have been made in Texas and throughout the nation. The decisions reached before have fallen into three categories: those that require a formal complaint by the government agency, others saying if a letter has been issued by the agency that is like a suit, while others have determined that it may depend on how coercive the action is to the company before it is considered a suit. Presented to the courts are documents that will allege that McGinnes Industrial Maintenance Corporation, a waste disposal company, removed waste from a paper mill and released it in three ponds adjacent to the San Jacinto River during the 1960s and early 1970s. So, the EPA began looking into alleged pollution of the San Jacinto in 2005. By 2007 the EPA issued a Potentially Responsible Party letter contending that it had contributed to the hazardous waste contamination at the site. The EPA demanded that McGinnes make reimbursement, prevent further contamination, and that the company fund a Remediation/Investigation/Feasibility Study. When the company presented this to their insurance companies, insurers indicated these were not lawsuits but government suits. McGinnes then filed a declaratory judgment action seeking a ruling. They contended that a defense was owed to them based on the policy as well as payment for more than $2 million in attorneys fees from the start of the action. A federal district court judge granted summary judgment for the insurers, determining that the EPA CERCLA Action was not a suit triggering the duty to defend. So the company appealed to the Fifth Circuit Court with the argument that suit was ambiguous in this contest but insurers argued a suit was a court proceeding. CROSBY The U.S. Environmental Protection Agency (EPA) and the Texas Commission on Environmental Quality (TCEQ) are in the process of reevaluating the ground water remedy chosen in the 1988 Record of Decision for the French Limited Site based on investigation and performance of the former selected remedy. A Public Meeting is to be held August 4 from 6:30 p.m. until 8:00 p.m. at the Harris County Public Library, Crosby Branch at 135 Hare Road. EPA and TCEQ representatives will participate and the meeting will be followed by a question and answer session. This re-evaluation is only about changes to the ground water remedy and not about changes to lagoon sludges and soil remedy selected in the 1988 Record of Decision. A Proposed Plan recommends preferred remedial alternatives for the Site ground water and identifies steps to be taken for continual protection of health and the environment. The idea is to contain ground water contaminant plumes into two ground water zones, and prevent exposure to contaminated ground water by implementing restrictions on access or use of contaminated water within the defined boundary. Finally, more monitoring wells and short-term monitoring to verify the proposed Defined Boundary; conduct long-term monitoring to ensure that the contaminant plumes are not expanding. Along with those two steps comes the promise of an extensive evaluation of data periodically and then take appropriate contingency measures as needed. Located near the San Jacinto River at Old Beaumont Highway and Gulf Pump Road, the French Limited Site was a sand quarry in the 1950s and 1960s that left a 6-acre sand pit. The location then accepted industrial waste material from 1966 until 1971 taking in an estimated 90 million gallons of chemical waste, transforming it into a lagoon. This site is within the San Jacinto River flood plain in a floodway subject to potential flooding. PCBs, arsenic, volatile organic compounds, benzene and DNAPLs have been found in the soil. So, after taking out contaminated ground water, remaining contamination was to weaken to levels below the federal and state drinking water levels. From 1992 until 1996, a ground water pump and treat system was in place working on affected water bearing zones. Since 1996 ground water monitoring has been performed to document if residual ground water contaminants can meet drinking water levels. No, it is not as safe as drinking water. Those parties named as potentially responsible for the pollution formed the French Limited Task Group in 1988. The French Limited Task Group has investigated and implemented remedies at the Site but hazardous substances remain in the ground water at the Site are addressed in the new plan. The plan is waive drinking water levels in the two zones. Prevent installing wells nearby and do statutory reviews every five years. The pump and treat remedy previously used are not capable of achieving results safe for drinking water. CROSBY  Change is coming in the form of two new neighbors and their impact has yet to be assessed but they will certainly be significant. When Goodwill Industries opens their doors in Crosby there will be two major thrift stores seeking bargain hunters and providing for needs in the community. The Goodwill Store and Churches United In Caring. Just months away from completion the store will be central to a hub of activities including the New High School going in behind the extant Wal-Mart. LDG Development is the driving force behind an income restricted, work force housing apartments currently getting the earth-work done to be between Newport Subdivision at Crosby Volunteer Fire Station #2 and the Jackson Bayou Community. The access to Newport through the Crosby Fire Department #2 has already been cut but asphalt has not been poured. The Jackson Bayou side has still a few feet of an illegal dump before where a road might be placed. The Jackson Bayou Community has for years asked Harris County and all local government for another egress out in the event of an emergency other than the one on FM 2100. Now another route will be close. The Texas Department of Housing and Community Affairs, Harris County Housing Finance Corporation, Community Bank of Texas, First Sterling Bank, and LDG Multi-family LLC are funding the $13.5 Million project that is to bring the new low density apartment structures to the area in early 2016. 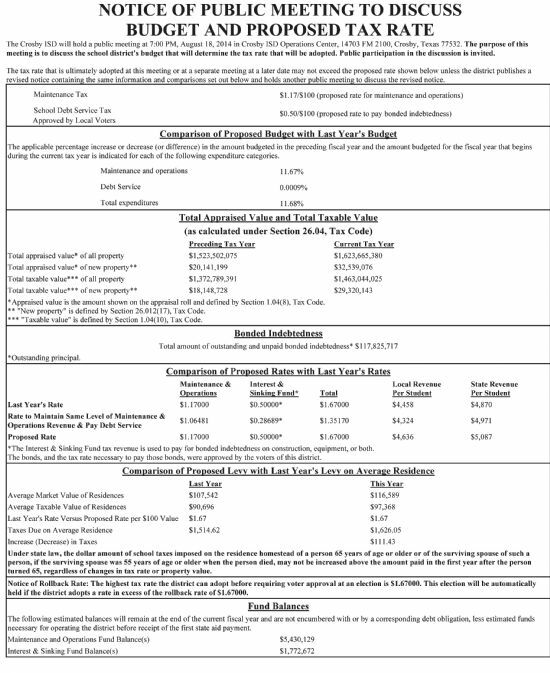 Harris County Housing Finacnce Corporation has two multi-family bond programs one for qualifying programs in that have 75% of all units occupied by families earning 80% or below AMFI and 5% for special needs tenants. LDG Development is the developer for Cypress Garden Apartments west of Cloverleaf near Hermann Brown Park, a residential apartment complex generally for those over 50 years. There is talk of a new residential dwelling going in behind the Straight Off The Road Restaurant in the Newport Subdivision. BAYTOWN  Parents and educators filled the board room of the Goose Creek district Monday night, as the board conducting their regular meeting, and heard public comments in the Citizens Participation section. For several weeks, stirred by print and social media, opposition to the superintendents style of administration, and his appointment of new principals for 2014-2015 school year, has been growing in the Baytown and Highlands communities. Cavazos announced new principals in 12 schools including two new ones. This followed a similar purge in 2013, when 8 principals were reassigned, many to lower rank and pay. The crowd of over 200 persons filled the board room and spilled out into the hallways. Most of the group seemed to come to air a grievance, and 21 persons signed up to make public comments. As each speaker listed what they perceived as Cavazos poor management decisions in district personnel, they were roundly applauded. Also voiced were criticisms of the board, for lack of oversight and allowing the superintendent to make wholesale and widespread reassignments of principals, and support staff. Some questioned recent decisions to spend $14million on new facilities at Lee High School, when much of it is unused. His policy to change teaching contracts to one year terms, effective in the next school year, was viewed by most as another move to remove large numbers of teachers in favor of new ones he helped select. Parents questioned the need for reassignments, noting that their children needed a stable environment to learn properly. They also felt that too many new principals and teachers would affect the state rating of schools. One example cited often was the situation at Highlands Elementary, where two years ago the school had three principals in one school year. The seven board members listened and took notes, and Dr. Cavazos also listened without comment. Superintendent Cavazos has been head of the Goose Creek district for two school years. He was previously superintendent at the district in Alice, Texas. His management style there, and here, has been to make frequent reassignments, terminate long term teachers, and bring in many new teachers. Highlands Chamber of Commerce president Jessica Woods, a mother of two GCCISD children, noted that the Junior School in Highlands lost 33 teachers in one school year. She stated to the Baytown Sun, When you wind up with a junior high campus that loses 33 teachers in one year  in one nine-month period  thats pretty dramatic, especially considering that so many of them have been there for so long. I dont know how long it is going to take for Highlands Junior to recover from the mess that was created, she said. Goose Creek Memorial High — Susan Jackson. Woods was only one of the 21 speakers that addressed the board, but echoed the sentiments of most. Others included Al Richard, a respected principal at Goose Creek Memorial High until he retired, moving to a similar position at Baytown Christian Academy. Mr. Richard criticized the reduction of 16 personnel to one year contracts, effectively notifying them they will not be asked to return in 2015. Also speaking was Tim Vaughn, fine arts director, who recalled in detail a confrontation he had with Cavazos, who threatened his job he thought, while demeaning him in the interview. Educator Brenda Boyd told of the change in atmosphere after Cavazos came, and the loss of respect and pride that the staff had. She noted that her husband, head football coach at GCM did not have his contract renewed. Late word to the Star-Courier indicates he has a new position in Anahuac. Boyd made the point that the children are suffering the most, in the unstable environment. Cavazos listened to all these comments, but did not respond. Observers feel that he was unmoved, and would not change his approach. He told others that many of the presentations were lies. Only one of the school board has openly criticized the administration, and this has not always met with approval from some of the community. Jenice Coffey, an educator, looked for support from the other six board members, but only found one other that was moved by the comments at the meeting. Observers felt that changes to the administration and board will not come until an election in May 2015, when four of the present board are up for re-election. Then it will be seen what the public at large feels about the situation, and whether they support the present leadership. One community member noted, Its hard to admit a mistake, and make a change, a reference to the hiring of Cavazos two years ago and the support of his policies by the action or inaction of the present school board. The whole meeting can be heard at the district website, www.gccisd.net. 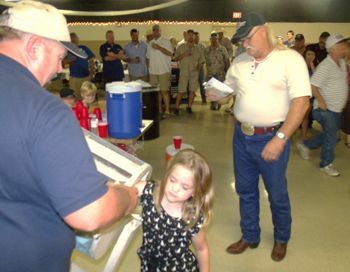 CROSBY  With the exception of the car show having to be called off until Sept. 20 due to impending thunder clouds, the Klobassa Festival at the Knights of Columbus Hall last Sunday was the ticket to fellowship and bid on some great items during a live auction. The auction was so extensive it wore out the voice of one auctioneer and Bill Busby filled in to take up the slack. A Czech barbecue was served for $10 and the amounts of funds raised was not available at press time on Tuesday. One proud bidder paid $660 for a carrott cake in good cheer as his friends joked about it, then he donated it back and bought it back again. Catching bids among others was Justin Wrestler and at least one baked good had the bid elevated after several personal inspirations from Wrestler. Those with winning tickets can claim their prizes at ACE Hardware in Crosby after a chat and background with Mr. Vernon Hord. But the real reason for the Festival is a great cause. Sacred Heart Charities and scholarshps for Sacred Heart School students. The Knight of Columbus contribute significantly to the surrounding area and now there are two chapters in the Crosby vecinity. The next attempt for the Car Show, that is to feature cars, motorcycles and tractors will be Sept. 20 and there is to be a Fish Fry at that time.